Many people dream of having their own hiding space or secret room in a home or building. This is typically not realistic for most people, but a few options are available. 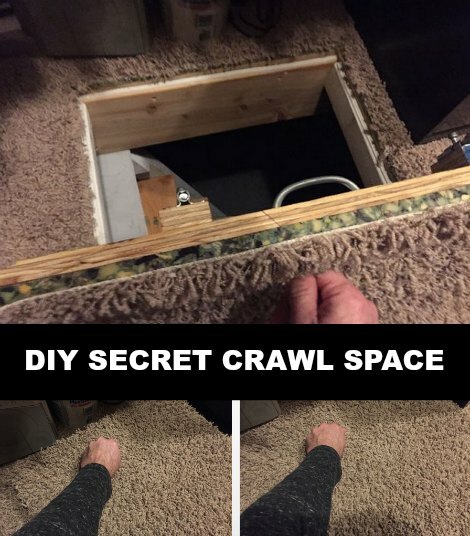 If you have an area under your home like a crawl space, then you have the option to build your own secret crawl space door. All of the material needed for this project is inexpensive and easy to obtain. There are a few details to consider before working on a secret crawl space door. You first need to see if you need to make any changes to your existing crawl space entrance. An existing hatch or a door might be too obvious based on where it is located. However, a secret crawl space door is a great idea if you otherwise do not have any access to the crawl space in your home. Creating a new access to a crawl space means removing a small section of your floor. This can be a challenge depending on the type of flooring and where you want your secret crawl space door to be located. You will need to find an area that has enough clearance and floor space before doing any type of work. The best way to create a secret crawl space door is to place it where there is existing carpeting. If a closet area is not being used, then this may be a great place to have the door. You will need to have a few basic tools on hand to complete this project. The most important is a knife used to cut through any carpet. You’ll also need a saw, drill, and the necessary hardware. All the tools and supplies necessary to build a secret crawlspace door in your home can be found at a local home improvement store, or you might be able to borrow them from a neighbor.